Let’s take a look at tides on Earth, which are controlled by the combined gravity of the Sun and Moon. The Sun and Moon each create a tidal “bulge” on Earth. That bulge makes the oceans stretch out in that direction. When the two bulges are lined up, the overall change the the height of water is the highest — those are “Spring tides”. When the bulges are not lined up the tides are weaker. Those bulges are just gravity. The gravitational force between two objects depends on how far apart they are. Two times closer means gravity is four times as strong. Take the Earth and Moon. The side of Earth that faces the Moon is a little closer to the Moon. So the Moon’s gravity pulls hardest on that side of Earth. And the opposite goes for the far side of Earth: the Moon’s gravity is the weakest there. Lines of force showing the tidal stretching of the Earth by the Moon. Adapted from Wikipedia. That stretching force — caused by differences in gravity on different sides of the Earth — is where those tidal bulges come from. Every object can make a tidal bulge on every other object, but the bulges only matter when objects are close enough so gravity is strong. For instance, the Earth creates a tidal bulge on the Moon by stretching the Moon’s rocks (since it has no oceans). But the tidal bulge that the Earth creates on Venus is so small that it’s irrelevant. Tides are a big deal on giant planet moons. There is a lot of tidal action on Jupiter’s four big (Galilean) moons, especially the innermost one, Io. Io is covered with volcanoes that are erupting pretty much all the time. The outgassing is even visible from space! Io’s volcanoes are driven by tides. Io has a tidal bulge created by Jupiter’s gravity, just like Earth does from the Moon’s gravity. Except Jupiter’s gravity is a lot stronger. The difference is that Io’s bulge is always changing shape. This is because its orbit around Jupiter is elliptical. It’s almost a perfect circle but not quite (it’s actually closer to being circular than Earth!). When Io is closest to Jupiter in its orbit the bulge is the biggest and when Io is farthest its bulge is smallest. The last piece of the puzzle is Io’s orbit. Why isn’t it a circle? Over millions and billions of years, tides couple the evolution of stars’ and planets’ and moons’ orbits (and submoons often go unstable). Tides usually act to turn elliptical orbits into circular ones, and also to make moons show the same face to their planet. But Io does not orbit Jupiter alone. Its neighboring moons are constantly giving it gravitational kicks. These kicks are nowhere near as strong as the ones Io gets from Jupiter, but they are enough to keep its orbit from becoming a perfect circle. Pretty simple, right? And guess what? Billions and billions of potentially habitable planets follow this recipe. Let’s start thinking about tidal heating in the context of planets orbiting stars. Tidal heating is really strong for planets orbiting close to their stars. Most stars are smaller and fainter than the Sun. Their habitable zones are much closer than Earth’s orbit around the Sun. So tides are much much stronger. This graph shows the tidal heat escaping from the surface of an Earth-sized planet in the habitable zone of different types of stars (the Sun is at 1.0). For scale, Io’s tidal heat flux is the red horizontal dashed line, and Earth’s internal heat (from radioactivity in the core and mantle) is the green one. Amount of internal heat created by tides on an Earth-like planet in the habitable zone of different types of stars. Note that the y axis is logarithmic and spans about 10 orders of magnitude between very low-mass stars and Sun-like ones. Wherever the gray line is above the red one, the planet is heated across its surface more strongly than Io. This happens for planets orbiting stars that are less than about 20% of the Sun’s mass. These are small, faint, red dwarf stars. Note: the solid grey curve is the same one as in the first plot. Io’s orbital eccentricity is just 0.4%, in between the lower two gray curves. The tidal heat flux increases dramatically for planets on orbits that are more elliptical orbits. Even a slight change in shape makes a big difference in heat. On the other hand, the tidal heat is much lower for more circular orbits. Volcán de Colima, Mexico. Photo by Hernando Rivera (Caters News Agency). See here. The main point is: when heat is generated inside a planet, it needs to get out! And that is what volcanoes do — they let heat out from the insides of planets. (Yup, volcanoes are sort of like planets barfing, but it’s best to try never to think of that). How many volcanoes do these planets have: a few high-powered ones or a zillion puny ones? Io has a few hundred volcanoes. Earth has about ten times more surface area than Io. For the same amount of tidal heat, Earth would either have ten times as many volcanoes as Io, or if it had the same number of volcanoes as Io then they would each be ten times more active. Boom! Tidal heat can also affect a planet’s atmosphere. The dust thrown up by a big volcanic eruption can actually block sunlight and cool off the planet — this is called volcanic winter and may be at the origin of some of Earth’s little ice ages. But tidal heating generally heats a planet up, of course. Enough tidal heating can trigger a runaway greenhouse effect. The planet’s atmosphere heats up a little, which makes it heat up more, and more, and so on. It’s a climate catastrophe! A runaway greenhouse effect on an Earth-like planet would turn it into a Venus-like planet. Same size and mass but much less pleasant to live on. (Fun fact: a hellish Venus-like climate is one of four possible stable climates for Earth — see here). Left: Venus, a hellish inferno (surface temperature of more than 400 degrees C). Right: Earth, a lush paradise. A runaway greenhouse effect would turn Earth into Venus. Let me get to the point: tidal heating can be really bad for life. Some tidal heating is no big deal. Tidal heating up to Earth’s level of internal heat may actually be a good thing, as it’s possible that it could generate or help sustain plate tectonics, which acts as a planetary thermostat (via the carbonate-silicate cycle). How much tidal heating is too much? A runaway greenhouse would sterilize a planet, and that is triggered at about a hundred times higher heat flux than Io. The planet Mustafar from the Star Wars movie Rogue One. That building is Darth Vader’s hangout. 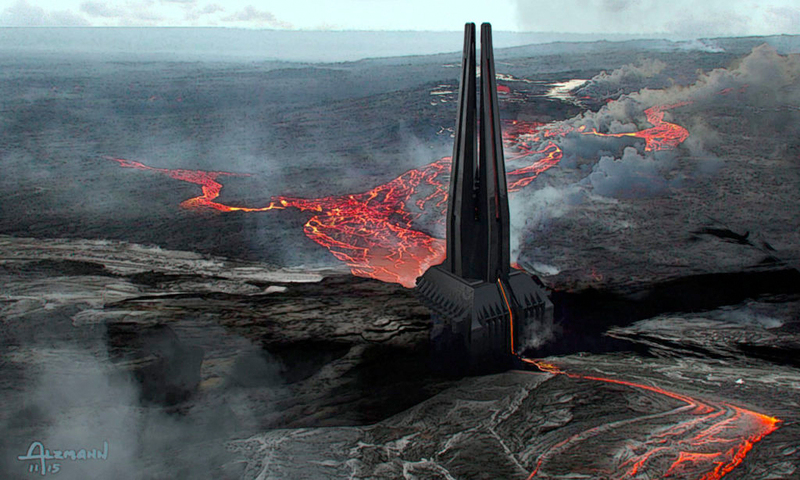 Mustafar is also the planet where Obi-Wan and Annakin had their battle in Episode 3. Really quite lovely, isn’t it? Credit: Lucasfilm (see here). So the limit for tidal heating to sterilize a planet is higher than Io’s heating, but not too too high (runaway greenhouse requires about 100 times more). How many planets are strongly affected by tidal heating? Back to our checklist for tidal heating. First up, strong gravity. That means that planets must be close to their stars. About 3/4 of all stars in our Galaxy are puny little red dwarf stars. Those stars’ habitable zones are really close-in, where tides are strong. And 1/3 to 1/2 of all puny red stars have Earth-sized planets in their habitable zones. Second, tidal heating requires more than one planet. The vast majority of systems of planets around puny red stars have many planets. Check. There are a few hundred billion stars in our Galaxy. Let’s say 400 billion to make the numbers work out nicely. That’s about 300 billion red dwarf stars, and at least 100 billion of which have a roughly Earth-sized planet in their habitable zones. 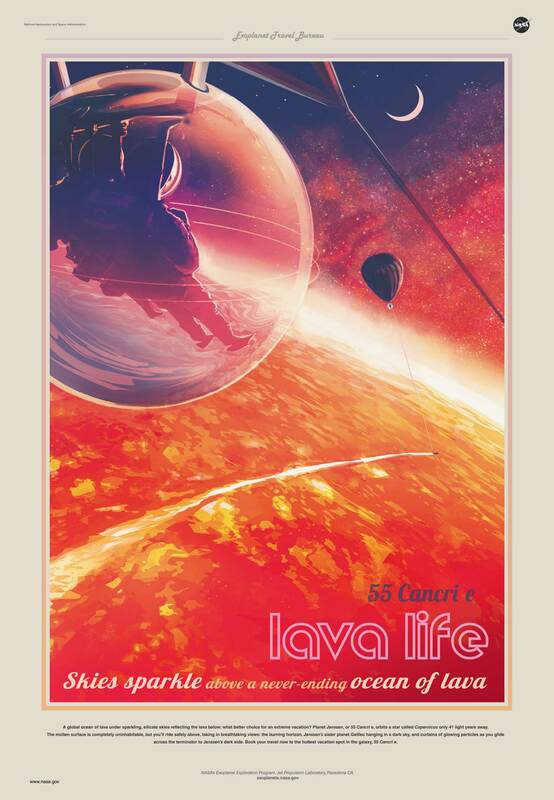 The NASA Exoplanet Travel Bureau poster for the very close-in (not habitable zone) exoplanet 55 Cancri e. Credit: NASA/JPL-Caltech (see here). That’s 100 billion planets! But what exactly does tidal heating look like? To answer this question we need to dip our toes in the dark waters of orbital dynamics. Let’s start with Earth. Earth’s orbit around the Sun is almost a circle but not quite. It’s very slightly stretched-out, with an orbital eccentricity of a little less than 1%. Earth’s orbital eccentricity from 1 million years ago until 1 million years in the future. An eccentricity of zero means a perfectly circular orbit. Source: Wikipedia commons. While these oscillations in orbital shape are relatively minor, they correlate strongly with Earth’s historical climate (called Milankovitch cycles). Other oscillations in Earth’s orbital and spin properties also contribute to these cycles. Venus, Mars, Jupiter and the other planets undergo oscillations in their orbits as well. It’s like a see-saw: one planet can’t kick another around without feeling the back-reaction. And each planet is kicking each of the others all of the time. In any system with many planets, the shapes of the planets’ orbits oscillate in time. And the orbits are rarely perfect circles. Systems of planets around red dwarf stars kick each other around just like our own planets. Earth’s orbital shape takes about 100,000 years to oscillate (see image above). The timescale over which a planet’s orbital shape changes depends on the orbital structure of the system. In general, planets on shorter orbits undergo faster oscillations than planets on longer orbits. Since planets with strong tides are so close to their stars, these oscillations happen much faster than on Earth. For planets in the habitable zone on which tides are strong — meaning around red dwarf stars — the timescale for orbital oscillations can vary between about 1 year and more than 1,000 years. Evolution of the orbital shape of the habitable zone planet Trappist-1e from an N-body simulation. The minimum eccentricity is just about zero (a perfect circle) and the maximum is a little more than 1%. While this is much lower than Earth’s maximum eccentricity, the tidal heating is much stronger. Credit: Emeline Bolmont. Remember: the time it takes for a planet’s orbit to bounce between different shapes can vary. The fastest is about 1 day and the slowest would be more than 1,000 years (Earth takes about 100,000 years). Note: other planets exist in this system but I have only included the one planet in the habitable zone. Even if the tidal heating goes up and down every year it doesn’t mean that volcanism necessarily will change on such a short time frame. Geological processes take time. What would it be like to live on a planet like this? Remember that the tidal interactions that create internal heat also affect a planet’s spin. Planets become “tidally locked”, always showing the same face to their stars. These are Eyeball planets. Planets on closer orbits would be “hot Eyeball” planets, with super-hot day sides and a “ring of life” (the super-romantic zone of permanent sunset/sunrise) in which water could be liquid, and ice-covered night sides. Artist’s conception of a hot Eyeball planet. The permanent day side is sun-baked and dry. The permanent night side is covered with ice. In between lies a thin ring where water can be liquid: the “ring of life”. Credit: Beau.TheConsortium. Planets on more distant orbits would be Cold Eyeball planets, completely covered in thick ice sheets except for a pond in the permanent day side. On tidally locked planets the Sun doesn’t move in the sky. There is no “day” because the Sun never rises or sets; depending on your location on the planet the Sun is either up or not, and it doesn’t move. The “year” is impossible to pin down on the sunlit side, but on the night side can be figured out from the motions of the stars. The year — the orbital period — is typically a few Earth days to a week or two, depending on the star. The action of tides also makes the axial tilts of these planets drop to very small levels. Earth’s axial tilt is 23.5 degrees and is the reason we have seasons. With no axial tilt these planets would not have seasons like ours. The only seasons on these planets come from their orbital shapes, when a portion of their elliptical orbits takes the planet closer to the star. This is a pretty cool setup for a science fiction story. Then things get crazy. Maybe warring factions battle over the small area of the planet that isn’t susceptible to volcanic destruction. Maybe there is a massive race to develop spaceflight technology, followed by a massive competition for the very limited cargo space on interplanetary flights. Can other planets in these systems be colonized? The best candidate for colonization might be a neighboring planet in the system has an orbital shape that oscillates out of phase (meaning, that planet’s orbit is circular when the main one’s is stretched-out, and vice versa) — by jumping back and forth between planets, a space-bearing civilization might be able to avoid the biggest volcanic blasts. There is another, dramatic mode of tidal heating. The example with oscillating orbital shapes is how systems behave most of the time. But not always. Sometimes systems become a little unstable. Not so strongly unstable that planets crash into each other, but unstable enough to rapidly stretch out the orbits of one or more planets’. There are a few different effects lurking in the dark waters of orbital dynamics that do this (for example, when tides drive planets across orbital resonances). When an instability hits, a planet can jump suddenly from a circular orbit to a stretched-out one. The rate of tidal heating skyrockets. Things can change fast. The planet cannot become a volcanic hellhole overnight. There is a time lag — the planet’s insides must heat up from internal friction and then magma must make it all the way up to the surface. I don’t know how long this would take but I suspect it would be measured in the thousands to millions of years. Imagine how a civilization would change on a planet whose orbit underwent a sudden dramatic shift. They might understand how their home planet was slowly heating up and preparing to become a volcanic wasteland and would need to figure out what to do next…. Finally, how deadly is tidal volcanism on our planetary death scale? Strong volcanic activity cannot destroy a planet but it can dramatically alter its landscape. It can cause massive extinctions. In extreme cases tidally-driven volcanism could sterilize a planet, for example when a planet on a circular orbit is kicked onto a stretched-out orbit. I need 2 star systems, for you to see if they are possible. First a 32 star mini solar system similar to the bottom. A giant circle with 4 mini circles in a weird orbit containing 32 stars. But in the center, there in a intermediate black hole(not one that would be at the center of a galaxy) with as many earth planets you can fit in. 32 outer solar systems have the normal orbits. And in the center of the weird circle in the core is a massive stellar to intermediate black hole with as many gas giants as you can with as many earth sized moons as you can. And the other is where the 32 planets are half gas giant and half normal orbits and normal orbits in the core orbiting the miniature black hole. Can you do this request? I’m not the one you’re looking for but here’s my two cents. If you have a black hole at the center, ditch the heiarchal binaries, the “center” of two binary orbits should always be empty space. The Black Hole Ultimate Solar System can fit rings of stars around it. The black hole itself can have either a ring of stars around it or a single luminous star around it. Then you can put terrestrial planets in orbit. The thing is, you really don’t want gas giants around the black hole, because they can’t have moons, the whole point of using a black hole is that we shrink the Hill Sphere, which is both a multiplier for how close planets can get to each other, and of how far out moons can orbit. You could make the gas giants really far out, but at that point, they’ll be so far apart that you might as well just put them around a star. And why not put them around a star? You can fit rings upon rings upon rings of stars into the black hole’s orbit. Rings and rings of K- or M-dwarf stars, each of them with gas giant ultimate solar systems. By the way, I’ve often thought in these discussions about star systems how weird it is that we consider heiarchal binaries all part of the same solar system. For the furthest two systems, they wouldn’t really be in the same solar system from a space travel standpoint, they’d be the better part of a lightyear away. Interstellar delta-v for going between two stars in a ring would be comparable to short true interstellar hops, albeit with a much shorter travel time. Interplanetary delta-v in the Ultimate Million Earth Black Hole Solar System is ridiculous, and rendezvous speeds are so high that a spent stage is a weapon of mass destruction. If I weren’t tired and just woken up I’d go into more detail about your system. But I’m just too tired, and I just woke up, so I’m not gonna go searching for the formulas I need. Except for especially sulphur-rich lava I don’t think it is possible for life to evolve resistance to lava. Other ones are too hot for water to remain liquid even under high pressure. But resistance to large temperature changes is definitely possible.